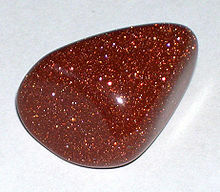 Aventurine Glass Aventurine Glass (Goldstone) is glass which sparkles (spangles) due to hundreds of tiny specs of metal embedded within the glass ("metallic glitter"). As can be seen in the three photos on the left, Aventurine glass is typically reddish-brown-golden (top photo), blue, or green. English-speaking people may be tempted to add the letter "d" (glass is an adventure after all), but it is said the name "Aventurine" derives from the Italian "a ventura" which is translated as "by chance", indicating that its discovery by Miotti in the 1600's was by accident. Aventurine is also sold in cane (round rod) form, for example, http://www.hobbyglass.com, and you see their blue and green products on the left. The basic process of making goldstone can be simplified as follows: a simple copper rich glass metal is prepared by fusing high grade sand, sodium carbonate, calcium carbonate, and copper oxide. When the glass in extremely liquid, iron or iron oxide dust is stirred in and dissolved to form a red, opaque glass that was once known as hematine. Rather than cooling the glass immediately, the draught of the furnace is then stopped, the ash pan closed, the pot with its lid on covered with ashes, and it is allowed to cool very slowly. (Sauzay 1870). Gold Aventurine has also been used over the centuries to edge Latticino (twisty cane). A good example of that can be found here. Our aventurine glass should not be confused with the form of quartz which has mineral (mica) inclusions and sparkles in a similar way, the sparkling actually bears the name "Aventurescence". Air Hose Definitely not a beginner's tool, but the Air Hose can be used to selectively (and rapidly) cool down part of the glass piece you are making. The Air Hose is also used when pulling cane, to cool the hot cane before it pulls too thin. 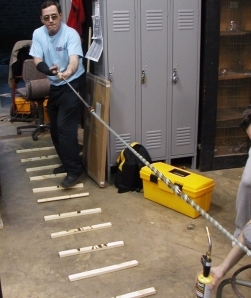 When cooling cane, the Air Hose is usually moved up and down along the length of the cane, to avoid missing the cane completely, which might happen if you moved the Air Hose horizontally (but were a little too high or too low), especially as the cane may be moving as it is being pulled at both ends. Annealer Glass does not like to experience the stress of rapid cooling or heating -- these stresses cause glass to crack or check -- sometimes violently. 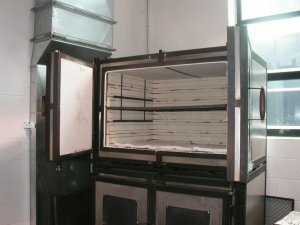 The purpose of the annealler is to gradually remove the stresses by gradually coolling the glass over a multi-hour (usually over night) process. There are two basic types of annealers: front-loading and top-loading. I prefer front-loading (as seen in this photo, with the front doors open), because you can just place the finished piece of glass more or less at eye level into the annealer with your arms outstretched. With a top-loader, and understanding that heat rises, much of your body is directly in and above the 800+ degree farenheit heat of the annealer! Many studios will provide protective clothing, up to and including a fire-proof suit such as is used for metal casting, to protect from the high heat, but the front-loader is just so much less intense a proposition. It is also when putting certain types of glass pieces in the annealer to use a moderately long metal tool. This tool has the advantage that you can place the piece in the back of the annealer, without having to even put your hands inside! These Christmas balls, were placed in the annealer with a long steel wire with a hook in the end, and rest in the annealer on a ceramic blanket of Unifrax Corporation's Fiberfrax ® because Fiberfrax is thermally stable up to 2300 degrees Farenheit. A forked tool exists to place fragile goblets in a similar way. 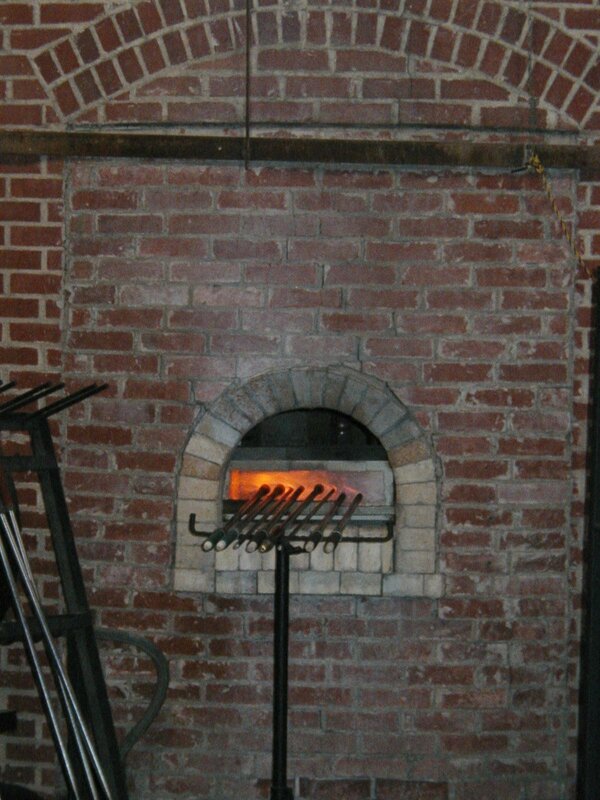 Sometimes called a "lehr", even by experienced glassblowers, but a lehr really refers to a long oven with a conveyor belt, where pieces gradually cool by moving slowly from the hot side (where they start annealing) to the cold side (when they are finished annealing). The Museum of Glass has a video showing the explosive properties of glass which has NOT been annealed properly. Batch is raw powder comprising the different chemicals which when melted form glass. However, the raw powders in batch can be dangerous to breathe. You can either mix your own batch, or purchase it already mixed. Spruce Pine Batch is very popular, and used by many studios. Compare with cullet. Bench The gaffer spends a lot of time at the bench. This is where he manipulates the hot glass. The bench (which can be setup left-handed or right-handed) has two arms which support the blowpipe, and allows the pipe to be constantly kept rolling. 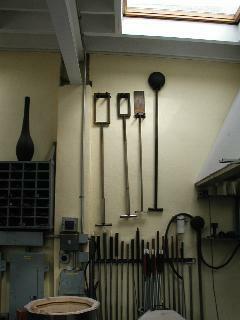 There is a table to the left which locates the tools of the glassblower (jacks, diamond shears, wet newspaper) within easy reach. At the bench the gaffer sits as close as possible to the arm of the bench as possible (this puts him/her as close as possible to the piece, and provides for better mechanical advantage when manipulating the hot glass). This bench was photographed during a class at Joel Bless's Glasslight Studio. 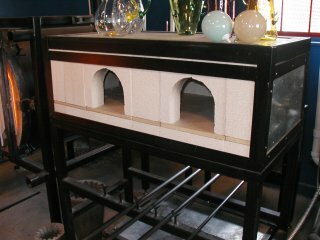 Click here for Correll Glass Studio's web page which details the construction of a glassblowing bench. Bench Rollers One of the things beginning glassblowing instructors always have to repeat over and over again to their students is to keep the blowpipe rotating by rolling back and forth on the bench arms. This keeps the piece from sagging downward if the blowpipe is kept in one place for too long. There are times, for example, when puntying up a piece, that it would be beneficial to keep the piece in one place (stationary) but still be able to rotate the piece! That may seem counterintuitive until you've noticed that alot of glassblowing benches have wheels welded to the from of the bench arms! 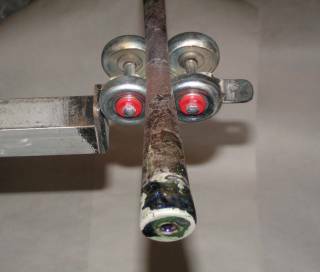 These wheels can be especially helpful for heavy pieces (it can sometimes take both a gaffer and an assistant to roll a big piece at the bench, because the blowpipe is now "top heavy" and glassblowing is all about leverage). 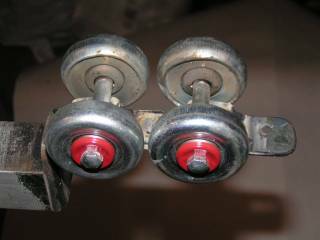 Joel Bless recommended the most economical way to add bench rollers is to get metal roller skate wheels. In the photo you see "MIB" (Mint in Box) metal roller skate wheels I got on ebay for US$17.50. I had a local welding shop weld them to the front of my bench arms (fortunately my Denver bench has a vertical flat surface on the front of the bench arms), and I got two "right angle brackets" at a local hardware store - they sell them for mounting shelving to a wall. The top photo shows a close-up of one bench arm. The lower photo shows how my blowpipe fits between the pair of roller wheels. You will actually have four pairs of wheels fron one pair of roller skates) -- two pairs on each bench arm. Blocks Block are an essential hand-tool of the glassblower to cool and shape nearly molten glass. Some glassblowers prefer to use wet newspaper for most of their shaping, but most Hot Shops will have a large variety of wooden blocks of various shapes and sizes. Blowpipe I really like my steinert blowpipes and punties! Shown at the left is the standard-weight 1.5" model. Relatively inexpensive at US$147.00 and made by the Steinert family. May I suggest the use of a blowhose (see the next entry). 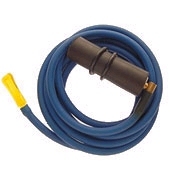 Blow Hose A blowhose is a flexible plastic hose which connects to the end of a blowpipe and allows the gaffer to blow air into a piece without the aid of a partner. I believe the blowhose also allows the gaffer more control, and you do not need verbal commands such as "more air", "slower", "stop" to tell your assistant how much air is needed. The end of the blowhose (that connects to the blowpipe) contains a swivel which allows the blowhose to assume a neutral position when the blowhose is rotated at the bench. The blowhose show at the left can be purchased from Olympic for US$32.50 It connect to a 3/4" (0.75") mouthpiece, which is the diameter of the standard Delrin mouthpiece used on Steinert blowpipes. p.s. one of the "odd" things I found when I tested my blowhose at home the first time is the the swivel is only "air tight" when it is connected to a blowpipe and you have some glass on the blowpipe, I believe because the swivel internally pushes back to seal the connection -- which is another way of saying if you try to test your blowhose at home, not connected to a blowpipe, you will sense air coming directly out of the swivel, but if you put your hand over the open end of the blowhose, to seal it, you will then see that the hose is sealed. The rubber part (of the blowhose that seals over the blowpipe mouthpipe) tends to be kind of "sticky" when new, as well as over time as it is used. I've found that the best way to make this part easy to put onto and take off (for example before the transfer) is just a little baby powder (talcum powder). You don't want the hose to be too loose and pop off when you blow, but you don't want it to be too tight either -- just as with most things about glassblowing -- you seek the middle ground that is just perfect... (alluding to the fact that as a beginner your glass pieces will often be either too hot or too cold). Book, Beginning Am I stretching the truth to list a book in a glossary, and name it as an essential tool of glassblowing? Not at all! If you are just starting out in glassblowing, you should get a copy of this book! and of the 9 people in the glass, 4 of the students brought this book with them to class. 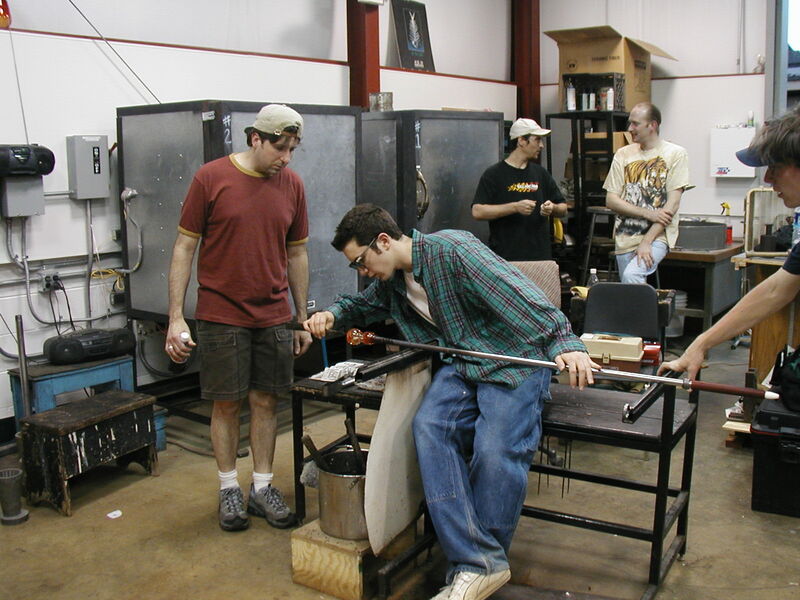 Not because it was required by the class, but because more importantly it is required to understand glassblowing. For me, it was proof that this book was an essential tool for someone who is serious about understanding glassblowing! . 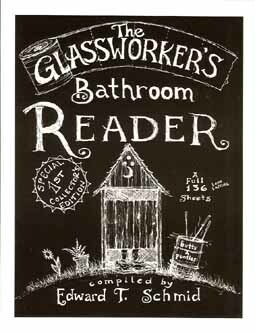 "The purpose of this book is to document, entertain, and forewarn you - the Reader - about the wide wonderful world of glassworking. 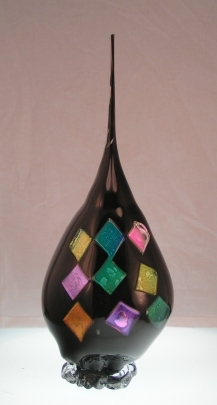 It is a collection of stories about life and times in and around the glass studio. A good deal of this book is from my own personal experience of working with glass for over twenty years, and some submissions from from other glassworkers from all over the United States and beyond." "One thing is certain: some truly amazing and horrific events have transpired over the years in this thing we call the Studio Glass Movement that I believe make for some pretty interesting reading and without documentation in one form or another, these stories and lessons to be learned may be lost forever." 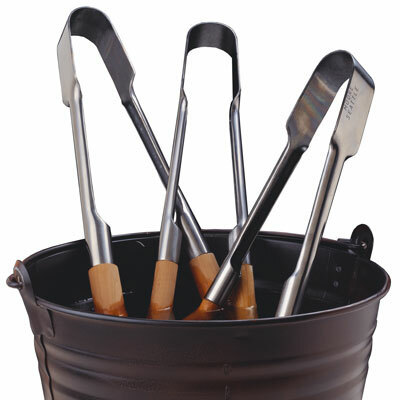 A bucket can be a plastic bucket or stainless steel pail used to keep wood hand-tools submerged into water. which keeps them from cracking (from drying out). Cane Pulling Cane is SO MUCH FUN! You do not normally think of glass as being a taffy-like substance you can twist with the strength of your arms! But you can, as long as the glass is hot! You can pull 5, 10, 20 or 30 feet of cane, depending on how much glass you start with, and how thick or thin you pull it. 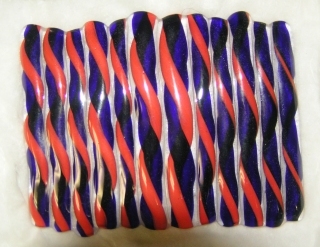 Cane sections (4" long to 8" long) can be used to make beautiful Venetian pieces, or the cane can be cut in cross-section to create millefiori (Murrine). Cane Marver A grooved (groovy!?) metal plate onto which you place your sections of cane. The grooves assure an even spacing. These will be heated up either with MAPP Gas or on the end of the pastorale (if will be tack-fused together). Click here to see cane laid out on the cane marver (and being measured with the Pi Dividers). Carbon Fiber Fabric Sheets Doug Ohm of Ohm Equipment pointed me to a wonderful source of carbon fiber fabric sheets -- McMaster-Carr. Carbon Fiber Fabric Sheeting resists flames and molten metal splash, making it ideal for protective clothing. Max. temp. is 800° F and can provide a protective barrier for as long as 2 minutes in temperatures up to 2600°F. The sheets are 60" wide and can be ordered in any length desired, but a foot or 1.5 feet may be all you need for a long time. McMaster-Carr has its own wikipedia page, which describe the company's strengths. No, not the thing you get when someone pays you for one of your glass pieces, this glassblowing term refers to cracks in the glass that appear after being in the annealer. The basic idea of the annealer is that it gradually removes the stress inside the glass, but if the stresses are too large, the glass cracks. 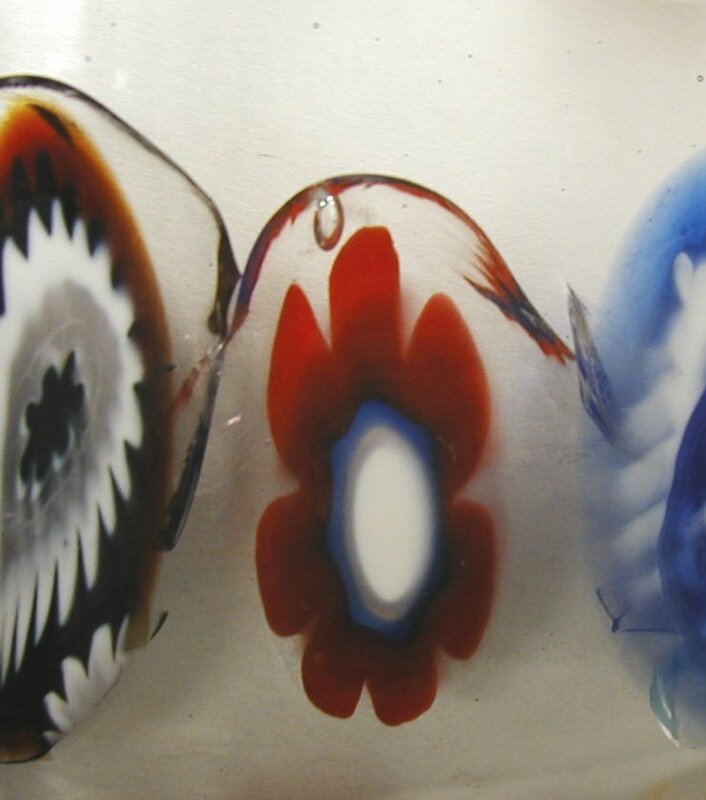 In this photo, the dark lines are cracks in the clear glass AROUND individual murrine. The base glass in the piece is COE 94 but the murrine are COE 104, and this difference is enough to crack the glass. I have used these murrine over ten times before, in three different batches (types) of glass, but I believe in this particular piece, the first one to crack, the murrine were not throughly melted (infused) into the base glass, although it visually appeared that way. Click on this image thumbnail to see a more detail image of the cracking. "my glass is checking in the annealer", etc. Crucible The crucible is the container inside the furnace that holds the molten glass. Normally the hot glass glows a bright orange color, and you can't easily see the crucible itself, but this photo was taken at La Sorgente Glass Studio with the crucible empty and the furnace off (cold), just to give you an idea of what the crucible looks like, and where it is located inside the furnace. 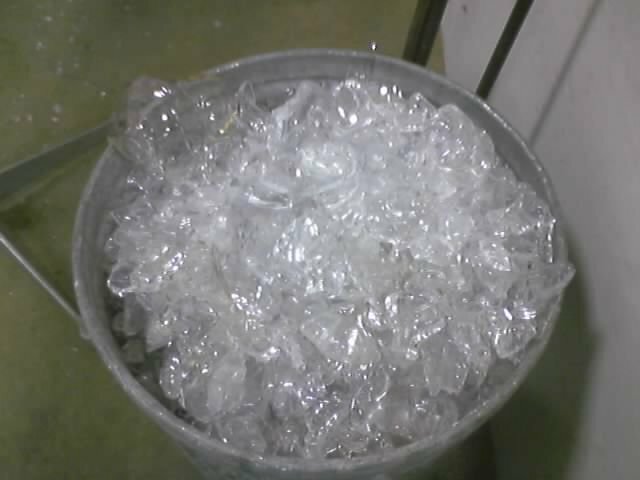 Olympic sells clear glassblowing cullet for $0.65 per pound. Diamond Marver The diamond marver is smilar to the cane marver, in that they are both plates with an embossed pattern. The difference is that the cane marver has lines cut into it, while the diamond marver has points cut into it. The points are similar in effect to the "pineapple molds". 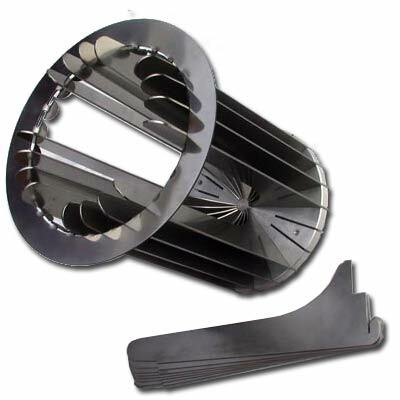 Steinert Industries is one of the primary manufacturers of the diamond marver. Diamond Shears This is a pair of well-used Diamond Shears photographed at Wheaton Village. They were photographed in their usual position on the table next to the bench. The end of the Diamond Shears has a curve which the gaffer would use to grasp a hot blowpipe or punty. 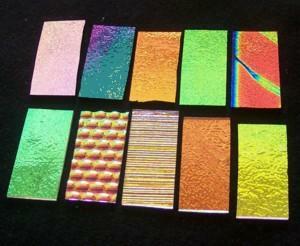 Susan Rostoff of Premier Glass Fusion & Jewelry Supply sells on ebay wonderful assortments (as shown in the image at the left) of relatively inexpensive dichroic glass ("dichro" for short) -- perfect starter kits for a glass student to experiment with. I have to warn you that dichro is expensive -- you think Kugler was expensive -- How about a dollar per square inch! Chris Rogahn showed me a trick to make sure you correctly identify the plasma (shiny) side of your dichro -- touch a pencil to both sides of the dichro -- you will see on the plasma (reflective) side that there is NO GAP between the tip of the pencil and its reflection! On the clear substrate (backing) you will see a gap between the pencil point and its reflection. Duct Tape It may be a surprise to consider duct tape as a glassblowing tool, but I learned this tip by watching Dante Marioni at Glass Weekend 2003 at Wheaton Village. I watched as the top of the LEFT bench arm was taped with duct tape, and asked afterwards why. The duct tape provides a little bit of cushioning so that the blowpipe/punty is not metal-to-metal. Note: taping the LEFT bench arm ONLY WORKS for RIGHT-handed glassblowers -- you always want to use duct tape on the "cold" bench arm. This definitely will NOT work if your bench is used by BOTH left-handed and right-handed glassblowers! In addition to the cushioning, I believe the duct tape also provides a bit more "traction" when rolling the blowpipe/punty back and forth on the bench arms. Ferritti These are the two or four metal bars which keep the glass from sliding on the ferro (metal plate) on top of the pastorale. The dimensions of the ferro are 3.5" long by 1/2" by 1/2". Olympic sells as part# C-FERRIT-TI four ferritti (made by Charlie Correll) for US$12.00. Ferro An Italian word for the metal plate (typically 12" long by 6" wide x either 1/4" or 3/8" thick) which is placed on top of a pastorale. The glass cane, milles, or pieces, which will be tack-fused in the gloryhole are placed on the Ferro and help in place with two or four metal bars named ferritti. 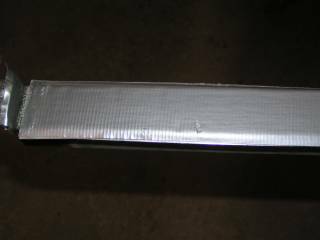 Olympic sells as part# C-FERRO) the standard-size Ferro (metal plate) made by Charlie Correll for US$75.00 and a large ferro part# C-FERRO-L 18" long by 8" wide) made by Charlie Correll for US$95.00. Kiln wash is placed (painted) onto the ferro to keep the glass from sticking when it starts to melt/fuse in the gloryhole. Fin Molds are similar in concept to Optic Molds except that fin molds do not have an outer wall. An analogy would be the difference between a regular car (with a hard-top roof) and a convertible -- the convertible has no limit as to how tall you can be. I believe the only fin mold that is currently sold commercially is Jim Moore's detachable fin mold (shown in the image on the left) which allows each of the 24 fins to be individually removed, so you are not limited (as with a cast optic mold) to one specific shape/design. The Jim Moore fin mold can be purchased directly from Jim Moore Glass Tools or through their distributors such as Olympic Color Rods. This particular type of fin mold is not to be confused with an "inside" fin mold used for goblet-making (image shown at the above right) which is used to make faceted goblets. 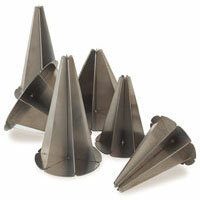 To the Right we have a 15-fin Glassblowing Fin Mold made out of 3/16" steel. Fluter The Fluter is NOT a traditional glassblowing tool. But I include it here to encourage your imagination as to what "found objects" can be used as unique glassblowing tools. Fluting Irons were designed to crimp, ruffle, and press pleats into starched fabric. 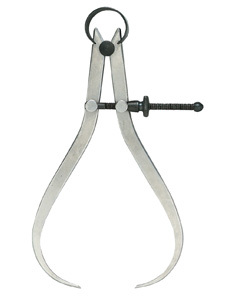 Fluters were used for collars, cuffs, etc. and say their greatest uses America during the 1860's, 1870's, and 1880's. which I find remarkable given that this cast iron device is well over 120 years old! they form a waffle pattern when pressed into the glass, it is rather unusual, and so simple! Frax Frax (Fiberfrax ®) is a ceramic blanket made by Unifrax Corporation which is used in an annealer because Fiberfrax is thermally stable up to 2300 degrees Farenheit. It can also be used in an Optic Mold when making ornaments. Frit Crushed pieces of colored glass. These are used to add color to pieces. Frit can range in size from very small (see also powder) to larger pieces. The effect can range from "dots" of color (including many colors of dots), but if enough frit is used to cover the entire piece, the effect can approach that of using rod. Here is Frit in a Tray made by cutting a can in half or here for a more detailed photo. If you have a really hot gather, be careful that it does not stick to (start to melt) the can. Metal Foils can be rolled onto the outside of hot glass bubbles. Please also see the glossary entry Leaf (Copper Leaf, Silver Leaf, Gold Leaf) for examples of using thinner metal. Furnace The furnace is where "hot glass" glassblowing starts from! Inside the furnace, the temperature is more than 2000 Fahrenheit. There are different ways to construct a furnace, but most today have a crucible. Gaffer The glassblower, master glassblower, artist working on a piece, or the person in charge of the project. 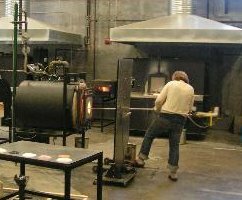 Glassblowing can be the work of an individual, but for both safety and practical reasons, glassblowing is usually done in pairs (or larger groups). The term "gaffer" is not limited to glassblowers. The movie industry confers a position of some responsibility to gaffers, and they are typically listed in the credits at the end of a movie. The term itself is British slang for "grandfather", which makes sense since the master glassblower is typically an older person who teaches the younger individuals (apprentices) in his charge. Dripping off the excess glass, after taking a gather A "gather" is the glass that you get when you go into the furnace with your blowpipe. Predictably, the "first gather" is the first time you go into the furnace, followed by the "second gather", and depending on how large your piece will be, a "third gather", "fourth gather", etc. The amount of glass already on the blowpipe largely determines how much glass you will get on the subsequent gather. Which is another way of saying that each gather after the first gets significantly more glass than you have alreay, because the diameter of the glass is already of a larger size. Also, the temperature of the furnace has a significant effect on the amount of glass you will get. With a relatively colder furnace (1950F - 2050F) the glass is somewhat more viscous (sticky), and you will tend to get more glass per gather than when the furnace is hotter 2050+. Blowpipe size also significantly influences the amount of glass you will get. A blowpipe with a 1.5" diameter head has a 50% larger circumference than a 1" blow pipe, so it is naturally going to pickup more glass. But the END of a 1.5" blow pipe is more than DOUBLE the size of a 1" blowpipe. First Gather: about 4 ounces of usable glass - the weight of a (hopefully beautiful) ornament (the glass hook is typically applied from a very small second gather of glass applied from a separate punty). Second Gather: can be anything up to about 2 pounds of glass, enough to make a tumbler, vase, bowl, etc. Third Gather: can be anything up to about 5 pounds of glass, enough to make a large vase or bowl, etc. Fourth Gather: can be upwards of 12 pounds of glass, enough to make a very large vase or bowl, etc. Note: many finished pieces of glass art have additional glass applied. 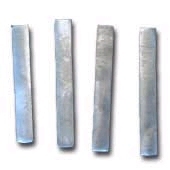 These are generally called "bits", and can include handles, lip wraps, spiral threads, feet, etc. 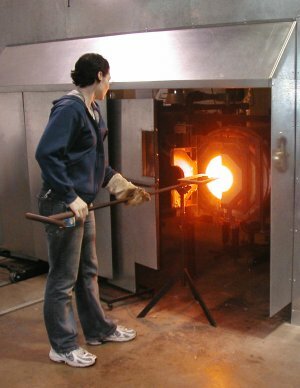 Gloryhole Usually a large insulated drum, which is heated with propane, heated into the 2000 - 2400 degree farenheit range, which is used periodically throughout the glassblowing process to heat up (maintain the temperature of) the glass piece being worked on. Most gloryholes have some type of doors which can be opened via handles or hooks to accomodate larger pieces, at the expense of more heat coming out the front, which can really "cook" the gaffer. Want to see something unusual? Here is a TV monitor at Corning Museum of Glass showing the INSIDE of the Gloryhole, through a transparent high-temperature silicon window in the back of the gloryhole, looking forward toward the front opening. 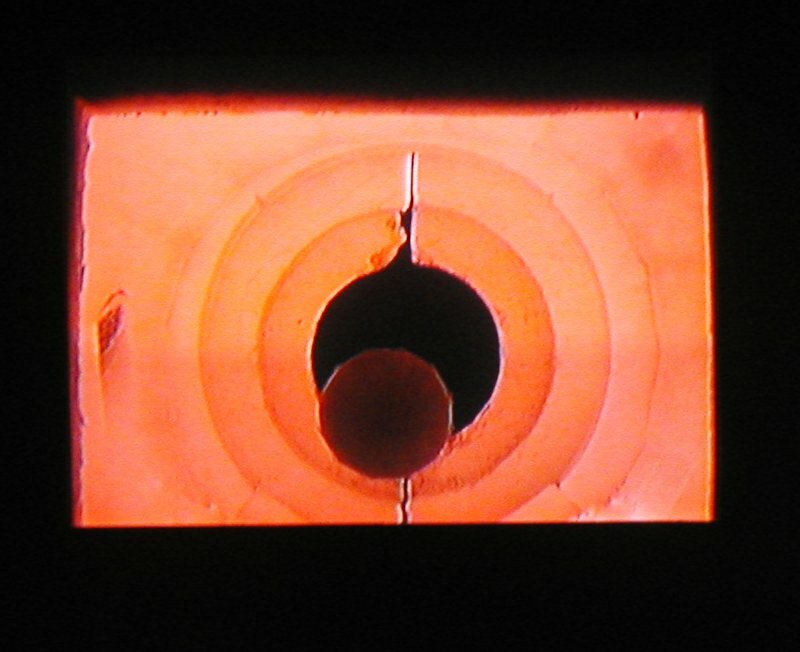 In this image, a ridged glass piece is shown, after it has been blown in an optic mold. 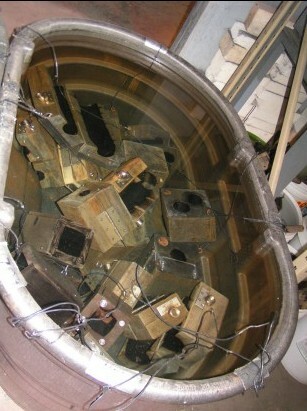 In this image, the burner is on the left, heating the piece. The photo at the left is Pat Ackerman standing in front of Joel Bless's large gloryhole. Gloves When you are ready to put your finished glass piece in the annealer, you'll need a pair of gloves to carry the piece (although you can break off directly in the annealer from the punty, this is seldom done). The gloves in the photo are from Wale Apparatus. A.R.T.C.O. (Artist's Reliable Tool Company) has a very valuable web page "How to select the right High Temperature Glove"
I highly recommend you read it thoroughly! (thanks to Karl Carter at BCCC for sending me the link). Cranberry glass (or Gold Ruby glass as it is known in Europe) is a red glass made by adding gold(III) chloride to the molten glass. Tin, in the form of stannic chloride, is sometimes added in tiny amounts as a reducing agent. The glass is used primarily in expensive decorations. Cranberry glass is made in craft production rather than in large quantities, due to the high cost of the gold and the delicate mixing process required. The gold chloride is made by dissolving gold in a solution of nitric acid and hydrochloric acid (aqua regia), producing a colloid. 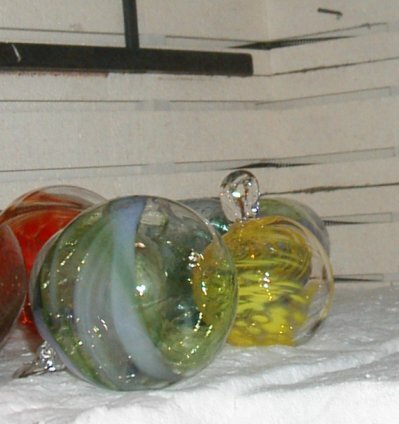 The glass is typically hand blown or molded. The finished, hardened glass is a type of colloid, a solid phase (gold) dispersed inside another solid phase (glass). The origins of cranberry glass making are murky. 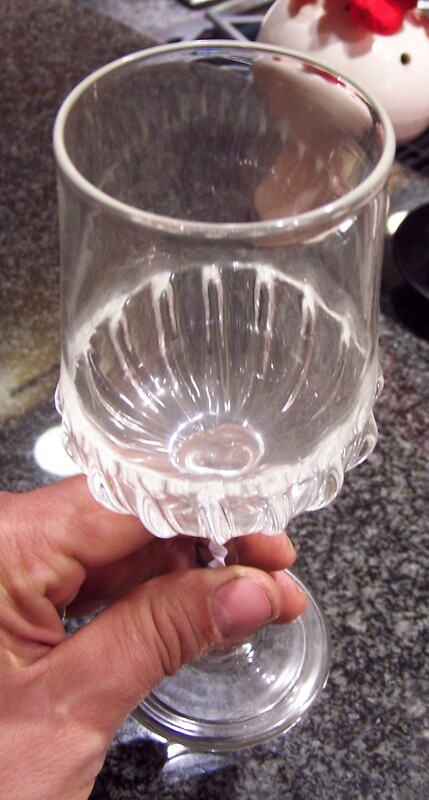 Some historians feel a form of this glass was first made in the late Roman Empire. The craft was then lost and rediscovered in the 17th Century by either Johann Knuckel in Bohemia or by the Florentine glassmaker Antonio Neri in Italy. But neither of them knew the mechanism which yielded the colour. The colloid chemist and later Nobel prize winner of 1925 Richard Adolf Zsigmondy was able to understand and explain that small colloid gold particles lead to the red colour. Legend holds that cranberry glass was first discovered when a noble tossed a gold coin into a mixture of molten glass. This legend is almost certainly not true, as the gold must be dissolved in aqua regia (a mixture of hydrochloric and nitric acids) before being added to the molten glass. Cranberry glass creations were most popular as a table display, often holding sweetmeats or flowers. 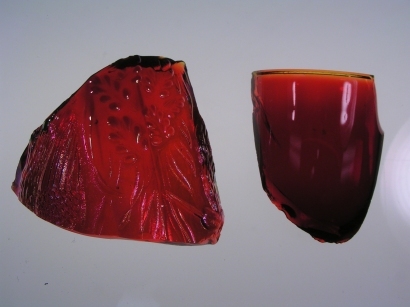 Cranberry glass was also frequently used for wine glasses, decanters, and fingerbowls. Cranberry glass was also well-known for its use in "Mary Gregory" glass. This glass had a white enamel fired onto the glass in a design, usually of romantic variety. Answer:For a ruby red glass you need to do what is referred to as "Striking of a ruby" or "Striking the glass". 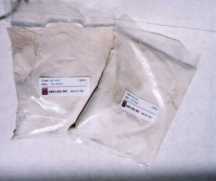 Add 0.01%-0.02% (wt %) Au to the batch along with small quantities of some reducing agent such as SnO2 or ZnO. Allow the glass to cool normally and don't be suprised, there will be no color. Here's the trick - after it cools heat it again to slightly above the glass transition temperature (in essence anneal the glass) and it will change to a ruby red color. Paddle Graphite paddles are often better to use than wood paddles , tagliol (steel metal paddle), or wet newspaper, because graphite does not cool down (take the heat out of) the glass as much. 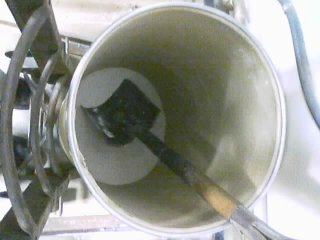 Once the glass has been cooled down, it must be reheated before continuing to work on, and using a graphite paddle allows an extended "working time". Unlike a wood paddle, you do NOT want to get water on your graphite paddle. 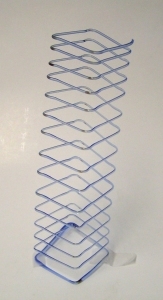 A hose clamp from a hardware store. Total cost was less than $10, and it is a good and useful tool, and has lasted a long time. 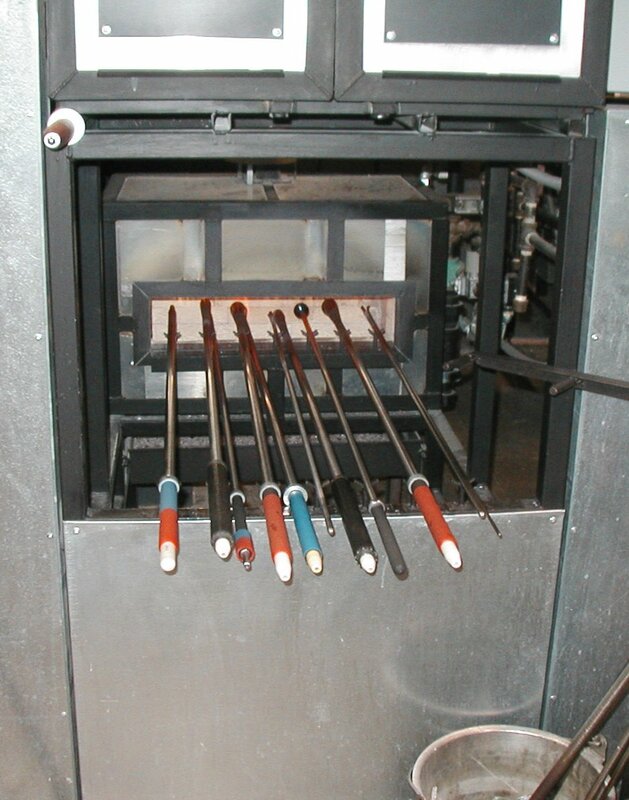 Please note that "different" graphite paddles are available for "hot glass" (furnace) glassblowers as contrasted with lampworking (torch) glassblowers -- the graphite paddles used for torch work are relatively small (for example between 1" tall x 3" wide to 3" tall x 4" wide) whereas a medium-size Jim Moore "hot glass" graphite paddle is 3" tall x 9" wide (and costs around US$70). DO NOT CONFUSE AMBIENT, CONDUCTIVE AND RADIANT HEAT! The following definitions are given as a reference as well as vital assistance in selecting the proper clothing for heat protection. 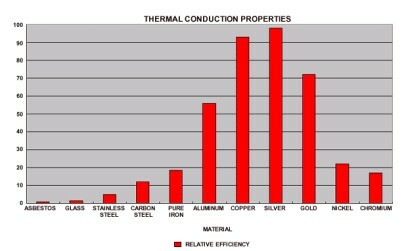 CONDUCTIVE HEAT is generated by direct contact with a hot surface. Examples: picking up a burner block at 600°F; leaning against a furnace wall at 1000°F. Heatshield Because so much heat is generated from a large gloryhole, it is desirable (to survive!) to have some type of heat-shielding from the flame. Typically situated to the left of the gloryhole, the heat shield provides sanctuary, if you stand behind it. Notice in the very nice example shown at the left, there is even a viewing port built-in. The heat shields have wheels, which allows them to be easily repositioned as needed. Don't have a heat shield? I've seen a Lino video where long notched wood paddles were carefully placed over the blowpipe/punty, between the yoke and the gaffer, to provide some relief from the most intense heat coming out the midline of the gloryhole. Jacks Jacks are an indispensable glassblowing tool! Click here to see the wide variety of glassblowing jacks available for purchase! 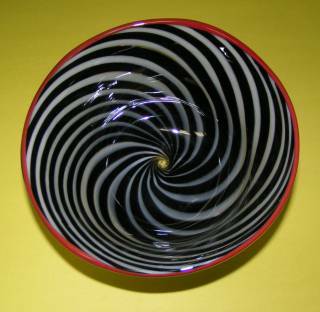 Glassblowing Souvenir For over a century, glassblowers have made these 3-dimensional rectangular glass spiral JACOB's LADDER souvenirs. These demonstrate the surprising elasticity of glass! 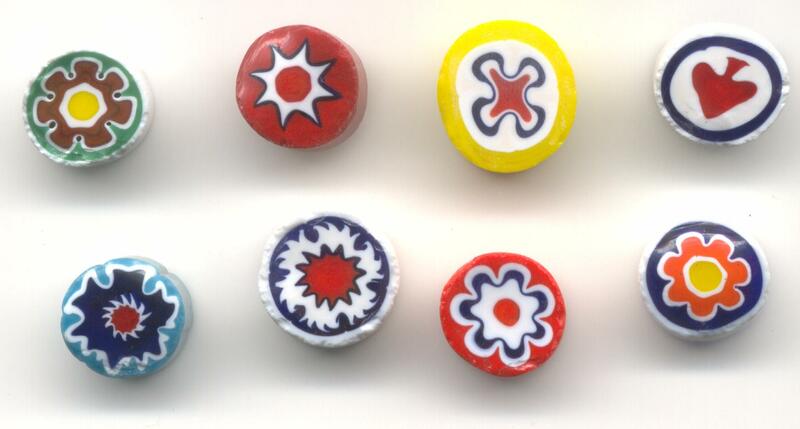 which is no doubt one reason why these have been used as glassblowing souvenirs. 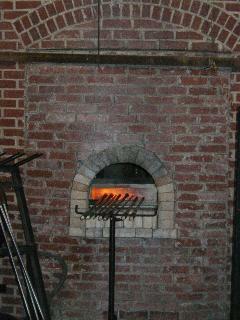 Heat to 300 degrees, keeping the kiln somewhat vented to let the steam out. Chris says that most people prefer Bullseye kiln wash (shelf primer), which is pink when mixed with water, but dries to white after being heated. 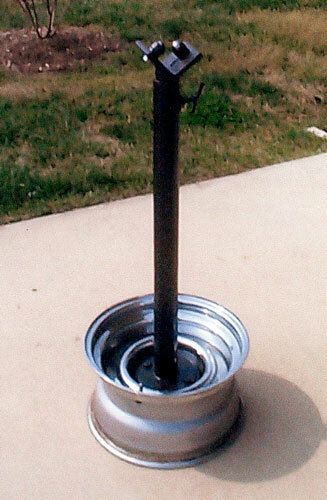 Bullsye's product number is 8220 and is sold in 5 pound and 40 pound buckets. The 5 pound bucket will coat approximately 150 shelves of size 20" square! Metal Leaf can be rolled onto the outside of hot glass bubbles. Please also see the glossary entry Foil (Copper Foil, Silver Foil, Gold Foil) for examples of using thicker metal. Lean Part of the "Ballet of Glassblowing" is the fact that the gaffer must often LEAN across the bench arm to work on a piece. This makes it easier to see the piece being worked on, especially the end of the piece, and to be perpendicular to the piece, for example, if you want to paddle the bottom of the piece flat. 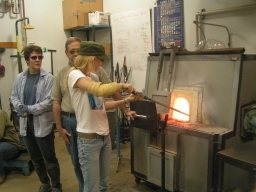 Shown in this photo is Tori Klaus during a guest artist demo at BCCC during the Fall 2005 semester. 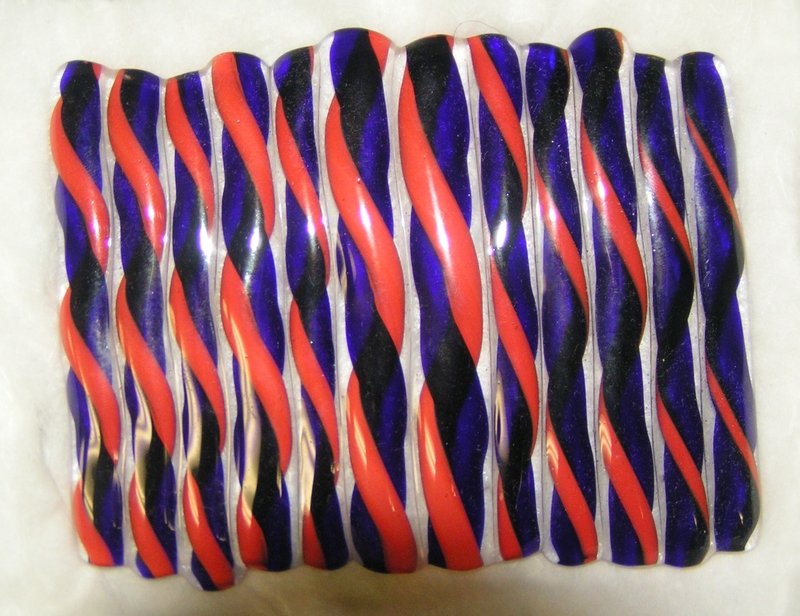 Lip Wrap (lipwrap) A Lip Wrap is a thin contrasting stripe (circle) of color added to the lip of a glass piece. It is typically one of the very last steps when working on a piece, as the lip wrap is added after the piece is transferred to the punty. The Black and White Piece with the Red Lip Wrap (lipwrap) was made by Tony Patti at BCCC during the Fall 2005 semester. Click here to watch a short video of Rich at BCCC adding a lipwrap to the glass vase he is making. According to google, nearly 800 web pages show the correct spelling as the two words "lip wrap" while only 100 web pages spell this as as one word "lipwrap". MAPP Gas I got my canister at Home Depot (in the plumbing section -- plumbers use MAPP Gas too! ), and they last a long time. They provide a fair amount of heat which can be focused onto a relatively small area (such as a cold punty where it attaches to the piece you are working on). It can significantly help with certain techniques: Phil makes a spout first by heating the area of the piece with the MAPP Gas torch, and then applying a bit of hot glass. This makes that area want to be the first spot to blow out, and in so doing Phil can make a spout, by controlling how that one hot section blows out as he pulls the glass at that spot. MAPP is an acronym for "MethylAcetylene-ProPadiene". The temperature of the flame is over 5,000 degrees Farenheit, so it is very hot, and also can be used for reducing colors (to make certain colors of glass have a metallic shiny appearance). Benzomatic sells the one-pound MAPP gas cylinder, and a torch head with a built-in push-button starter as their TS4000ZKC kit. It is a great way to get started. Marver Basically a sturdy metal table with a flat surface. The marver derives from the French word for "marble", as these tables used to be made of quaried marble, but marble has a tendency to crack because of the heat, and is much more expensive today than steel. Metal has the greatest tendency to pull the heat out of a piece. Sometimes this is desirable, but in general, the marver is used only when necessary -- there are much more subtle ways of controlling the glass, without losing so much heat. Paper Marver is a variation. The literal Italian translation for mezzostampo is 'half stamped' or in English half pressed. The process is simple to describe and, like so many things in glass, hard to do. There are people who can do this really well. 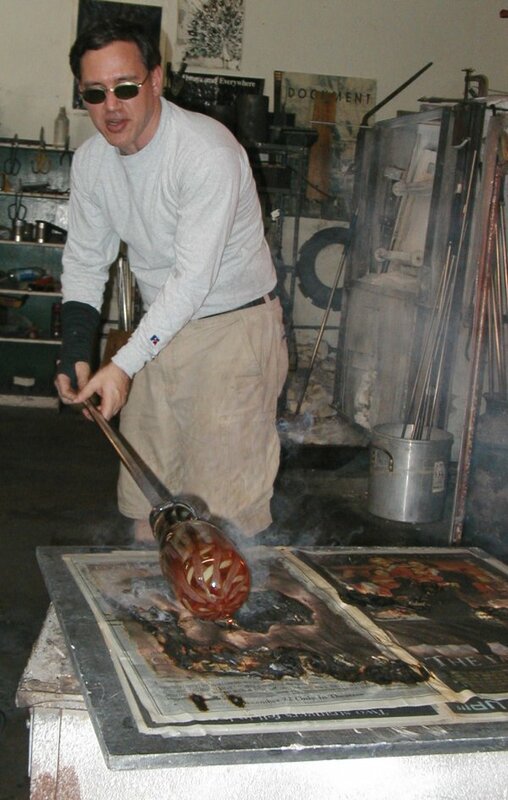 I've a seen similar technique done on museum pieces with cane from a optic mold in an oven, but I've never seen anyone do it. The photo shows one of the first mezzostampo goblets I made, because nobody has a mold that's actually any good for this specific purpose, in my opinion. Millefiori "Millefiori" is Italian for "Thousand Flowers". Click here for a scanned image (at 600dpi) of some millefiori. Optic Mold The optic mold is used to blow an evenly-spaced pattern into the glass piece you are making. You get your bubble really hot, place the bubble into the mold, and blow. As you blow, the piece expands into the mold. One of the areas to watch out for is that you might make the bottom too thin (or too thick) -- like everything else in glassblowing, this takes a little practice! When making Ornaments, often an optic mold is used as a holder, with some frax filling the hole at the top. 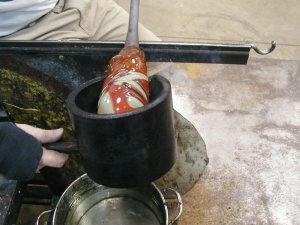 The ornament (without its hook) is placed from the blowpipe onto the frax, supported by the optic mold, and then a small gather of glass is gathered on a punty to make the hook. Here is another photo or a larger version. Ove Glove Glassblowing students work hard to learn how to manage and adjust to the intense heat of the glassblowing process. There are photos of me (not on this website!) as a beginner wearing heat-resistant sleeves on both arms. I'm now at the point where I wear long sleeve T-Shirts (during the Spring and Summer) and long sleeve sweatshirts during the Fall and Winter. These provide good protection to the arms, but the hands are unprotected during lip wraps and lip trimming when the hands are in very close proximity to very hot glass! Many times I've seen students nearly unable to complete trimming of a lip, or have to take a quick break, due to the heat. I think putting on an "Ove Glove" is the secret to keeping your hand cool during these processes! The Ove Glove is a product of Joseph Enterprises, and their website is http://www.chia.com/oveglove.html. 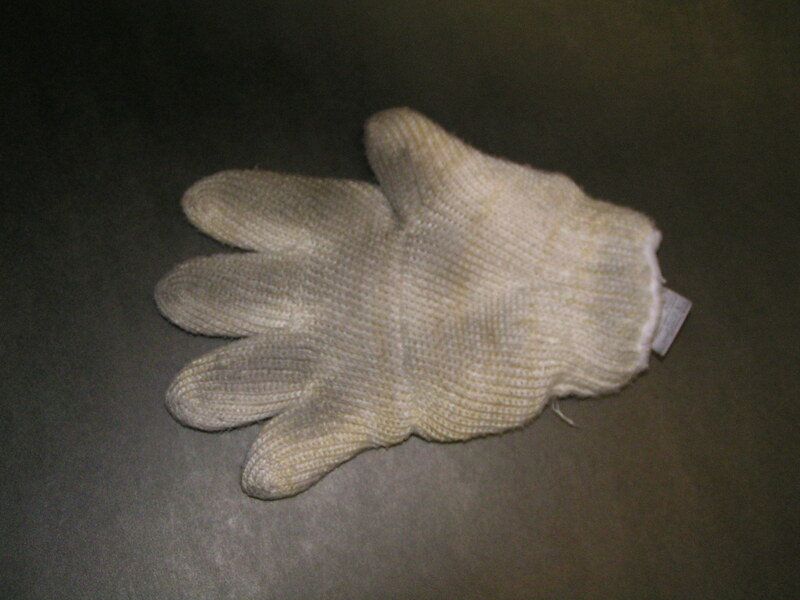 The Ove Glove is made of DuPont Nomex and DuPont Kevlar, and withstands contact temperatures up to 540F. This is not rated to touch hot glass! But our goal in wearing it is to keep the intense radiant heat away from the hand. They have an interesting video on their website, showing the use of the Ove Glove in the kitchen and at a barbeque. Please note that I am pointing to what they call the Handy Man's Ove Glove, this is a "plain" glove and does not contain the silicone grippy dots. These gloves are available from many sources. Please not that these are sold individually (NOT in a pair). But this is OK for glassblowing, as you are just trying to protect your hand that is working close to the hot glass. you might be able to get a good Ove Glove deal on ebay in the $9 - $13 range. Hint for frinds of glassblowers: an Ove Glove makes a wonderful, inexpensive, and appreciated gift to your glassblower friends! Parchoffi Parchoffi are "wood jacks", the idea is that the wet wood does not "scar" the glass like metal might. The image at the left is from the highly-recommended Jim Moore Glass Tools website. I heard a clever name for parchoffi, during the Fall 2011 Guest Glassblowing Artist demo at BCCC, they called these "lumber jacks"! Pastorale Pastorale is the Italian glassblowing term for a large metal tool. 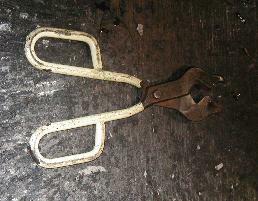 The tool has a long handle, and a flat plate on the end. 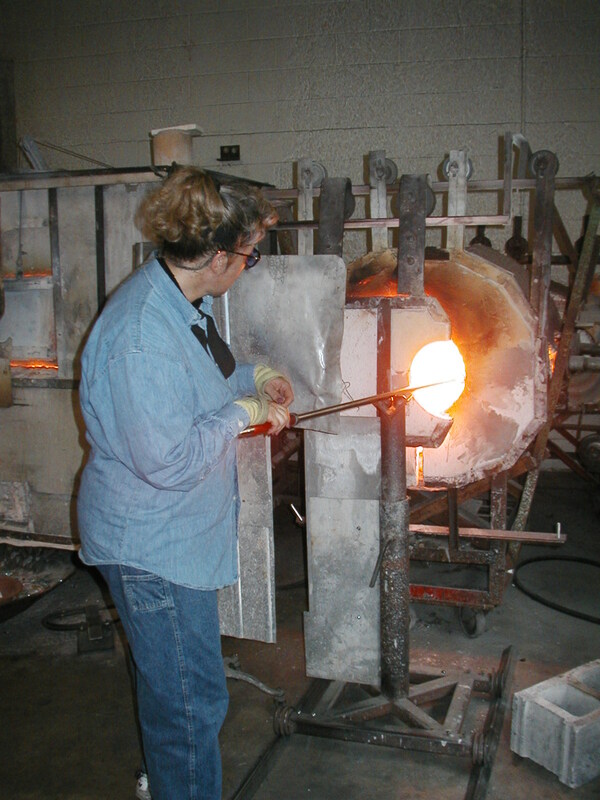 In this picture, you see Stephanie placing the Pastorale into the Gloryhole in Studio B at Corning Museum of Glass, to heat up some Spectrum 96 COE sheet glass which has been cut into diamond shapes, prior to picking up this colored glass on a bubble. The goal of the heating process is to slightly melt and/or tack-fuse the glass (often cane) so that it can be picked up on a blowpipe. Click here to see several pastorale hanging on the wall at LaSorgente Glass Studio or or an even larger photo of the same four pastorale hanging on the wall. On top of the pastorale is placed the Ferro metal plate, and on top of the ferro is placed the glass being fused -- and the ferritti metal bars are used to keep the glass from rolling off the ferro. Other than this Glassblower.Info website, Google only lists FIVE other references across the entire Internet for the google search: pastorale glassblowing The pastorale is vital for picking up cane, spectrum 96 checkerboards, and millies! 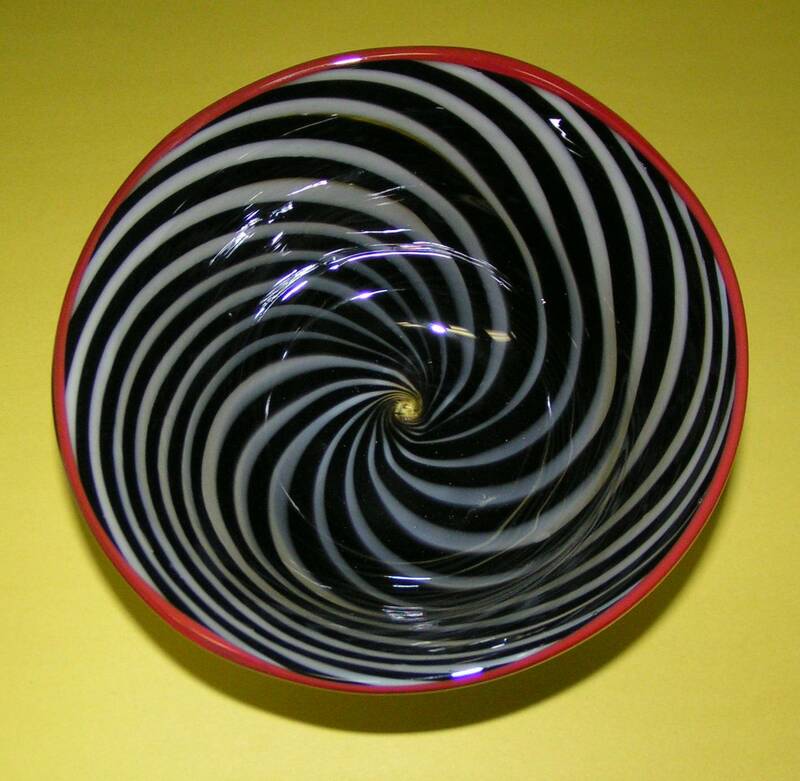 Syllabus for Art 371-001: Intermediate to advanced glass working. Be sure to check-out Daniel N. Marder's "10 commandments" for this course! Paper Marver Paper Marvering is something I learned from Joel Bless at Glasslight. 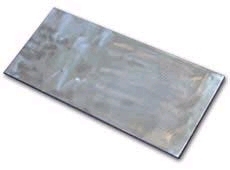 It is similar to using a steel marver, except that the wet newspaper (1) removes much less heat than the steel, allowing you to work longer, (2) is quite "slippery", allowing you to move much more easily and precisely, and (3) allows you to get much crisper sides to your cylinders, cones, etc. The paper marver is nothing more than several sheets of thoroughly wet newspaper placed on top of a sturdy heat-resistant table. 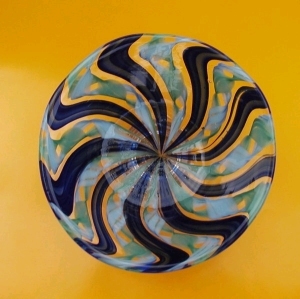 It is important, as with all glassblowing, that when you first place your glass piece down on the paper marver, that you have it rotating at all times (to avoid a very flat spot! ), and keep the weight of the piece mostly off the marver, with your arms supporting the piece (so that it is easier to spin, and here again avoids a flat spot). 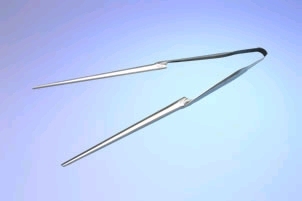 Pi Dividers are a metal tool that allows you to correlate the circumferance of cane laid out on a cane marver, to the necessary diameter of a glass gather (bubble) which will exactly pickup that cane, having the first cane section meeting the last one when everything is rolled up. 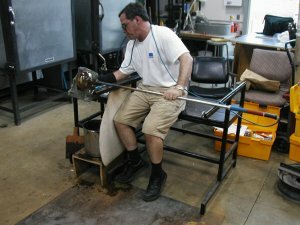 In this regard, particularly noteworthy is Correll Glass Studio's web page http://www.correllglass.com/pi_divider.htm which uses algebra to reach the conclusion that "Set the Pi Divider a bit more than three cane diameters short" whenever you are doing a cane pickup (the same advice applies slab or murini pickup, to setting your Pi Divider short by a little more than 3 times the thickness of whatever you are rolling to pickup. One of the things you definitely want to avoid doing is grabbing the blowpipe where it is HOT! After you gather from the furnace the blowpipe can DEFINITELY get hot, and as you reheat in the gloryhole, the pipe can also heat up ALOT! 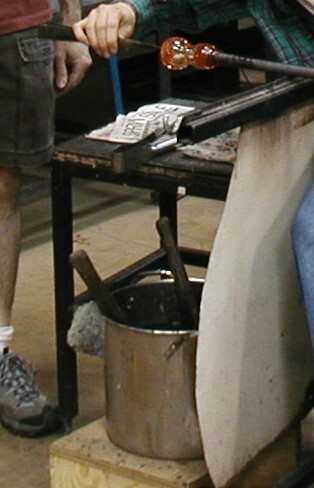 So, you can cool the blowpipe in several different ways, depending on the studio: with some wet newspaper, or with a wooden pipe cooler box containing water from a barrel, or in the more sophisticated studios, a foot-activated pipe cooler such as is seen here at Studio B at the Corning Museum of Glass. The blowpipe sits in the grooves in the topmost portion of the pipe cooler, and when the foot pedal is activated, a small fountain of water shoots up to cool the blowpipe. It is recommended that you cool the blowpipe moving from the middle of the blowpipe towards the end, as this tends to "push" the heat away from the portion of the pipe that you use/hold. Ed Christianson pointed out that these are often battery operated (located underneath), so there is no power cord to trip, going across the floor. 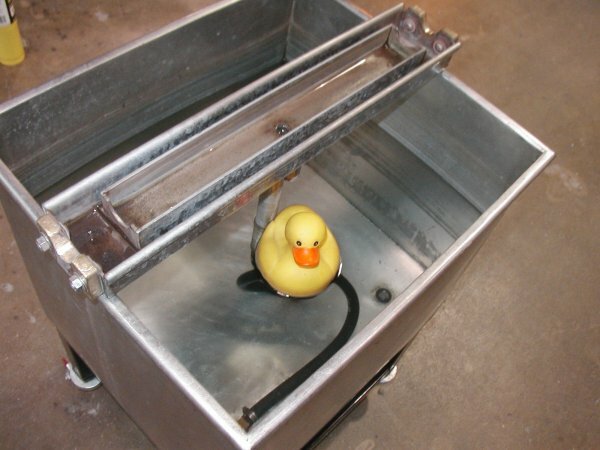 And, yes, I do think the rubber duck is essential to the proper operation of this tool! Pipe Warmer Hot (molten) glass does not stick to cold steel. Therefore, blowpipes and punties must be heated up, prior to use. The pipe warmer (an open flame) accomplishes this quite well. By having multiple blowpipes and punties heated up in the pipe warmer assures that you'll have the tool you need when you need it (for example to apply hot bits). Click here to see the Pipe Warmer in Studio B at the Corning Museum of Glass. Polarized Light (polariscope) A polariscope is used to detect internal stresses in glass and other transparent materials such as plastics, etc. 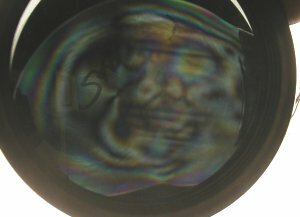 You can make a polariscope from a pair of polarizing filters can be used, over a light table, to see the invisible stresses in a piece of clear glass. In this photograph, Joel Bless is holding a piece of glass, dropped on the marver, and forced to cool to room temperature WITHOUT annealing. The colored bands shown by the polarized light show the major stresses within the glass. Properly annealed glass, or glass which has cracked as its only way to relieve its internal stresses, would not show these colored bands. The word "Standard" is hand-written in black magic-marker on this piece of glass (the large "S" is rather visible in the photo). As noted above, the polariscope is not limited to testing glass, it can also test for a gemstone being double or single refractive, which can be an aid to gemstone identification. There is another term you might see: "Birefringence", or double refraction, to desscribe the decomposition of a ray of light into two rays (the ordinary ray and the extraordinary ray) Many plastics are birefringent, and there is a specific type named stress-induced birefringence. No, not that kind of "pot" -- a "flower pot"! in the bottom of the flower pot, hopefully creating intricate designs! 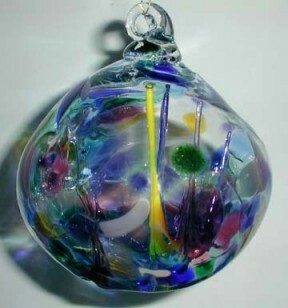 This can be glass art all by itself, or can be picked up on a blowpipe. Powder A fine powder of colored glass, which is used to evenly color (coat) a piece of glass. Compare with frit which is small bits of color. Powder, being fine glass particles, is EXTREMELY DANGEROUS to breathe! Let me repeat that statement! Silicosis is a chronic lung disease which develops after prolonged exposure to silica (glass) dust! To help protect your lungs, hopefully you will use a Powder Booth (see next entry, below). The photos shown at the left are two views of Ed Branson's Powder Booth. Notable feature is the large exhaust fan at the back to remove the airborne powder from your breathing environment. 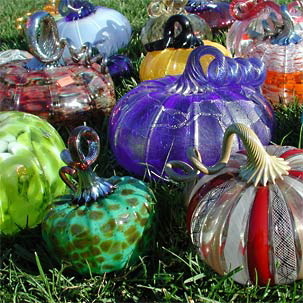 Pumpkins One of the types of glass art that really resonates with people is: Glass Pumpkins. Glass pumpkins are relatively easy to make with an optic mold. MIT has created a two-page PDF which basically describes the process. You can download the PDF here or mirrored here. Punt Not to be confused with "punty", the term "punt" (according to Google's "define: punt") is the name of the indentation found in the bottom of most wine bottles. For the wine drinker, the punt may have multiple purposes including adding strength to the bottle (especially for sparkling wines), and allowing sediments to collect at the bottom of the bottle around the punt (this only works when the bottle is upright). 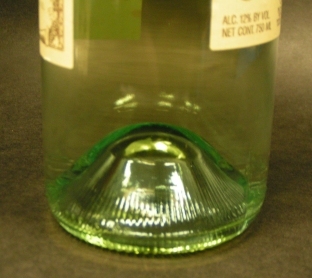 Originally the punt was an indication of a quality bottle. 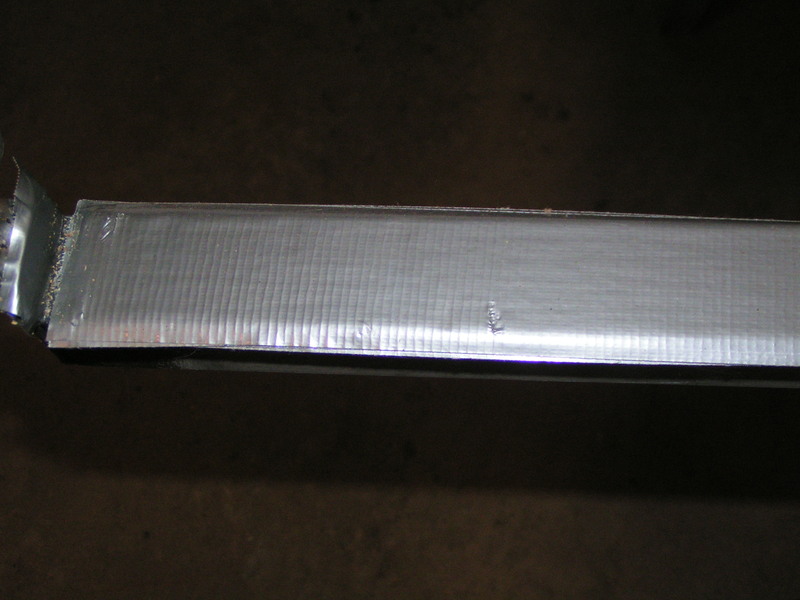 3. when the glass piece is broken off of the punty (see defintion immediately below), the bit of glass which is left behind from the break-off, will (hopefully) be in this indentation, and therefor the piece will sit flat in the annealler, and will not require grinding to sit flat on a table when finished. Punty A punty (sometimes "punty rod") is used for several purposes. The most important is to transfer a piece from the blowpipe to the punty, so that the top of the piece can be opened up. The punty is also used to bring bits of clear glass from the furnace, and also to bring colored glass, for example to thread (spiral) onto a piece. Punties are available in both solid (steel rod) and hollow rod forms. I highly recommend you try to the hollow punty first, and just as with blowpipes, I recommend you try Steinert. Reactive Glass Colors The colors you see in glass derive from metallic elements ("elements" in the context of high school chemistry class and the periodic table). As was learned in that class, elements and chemicals can interact to create new compounds, and glass is no exception. This reactive glass charactistic applies to all fields of glass making: hot glass, warm glass (fusing), torchwork (some beautiful beads and marbles make wonderful use of this technique), even pate de verre. This reaction occurs when glasses with different chemistry touch, or if you will, there is a new (different color) interface between the glasses. The interface (new) color can be red (as shown in the image to the left), black, or brown. Bullseye Glass: A Riot of Effects"
Reducing Colors Certain colors of rod, frit, or powder will change colors if they are exposed to a reducing flame. This is a flame lacking in oxygen. Students will sometimes place newspaper into the glory hole (the paper then quickly catches fire, and the fire robs the glory hole of oxygen, and thereby the piece is exposed to a more propane-rich flame. To quote Northstar Glass, "Some colors turn out better in an oxidizing flame, while others turn out better in a more reducing or neutral flame." Generally speaking, colors which reduce can have a very metallic (silver) look, even though the color may start out "normal", such as black. Remember that in general the colors in glass derive from metallic oxides which have been added to the glass. 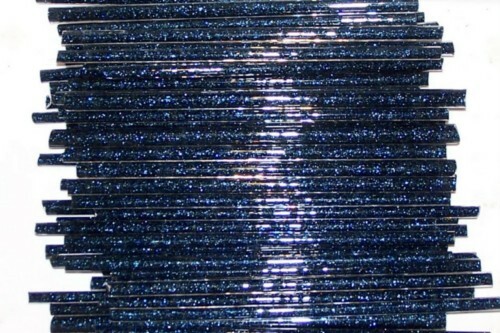 The photo is of Gaffer G-60 Silver Blue Luster sold by Olympic Color Rods. Rods are the solid/cylindrical form of glass. 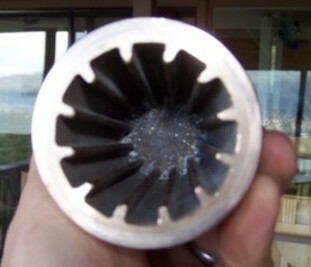 When broken up, rods can become frit or powder. 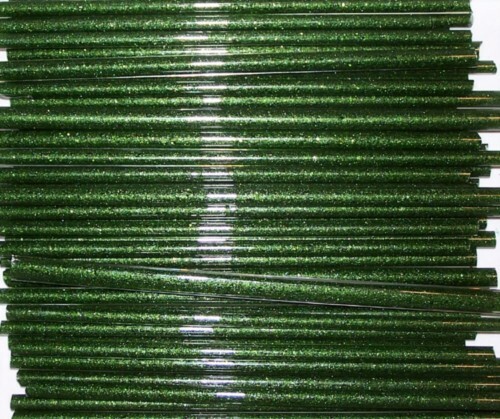 Rod is often used in small pieces, perhaps 1" in length, to blow a piece of glass all the same color. Rod can be cut into small chunks with a "rod cutter" or small pointy hammer. 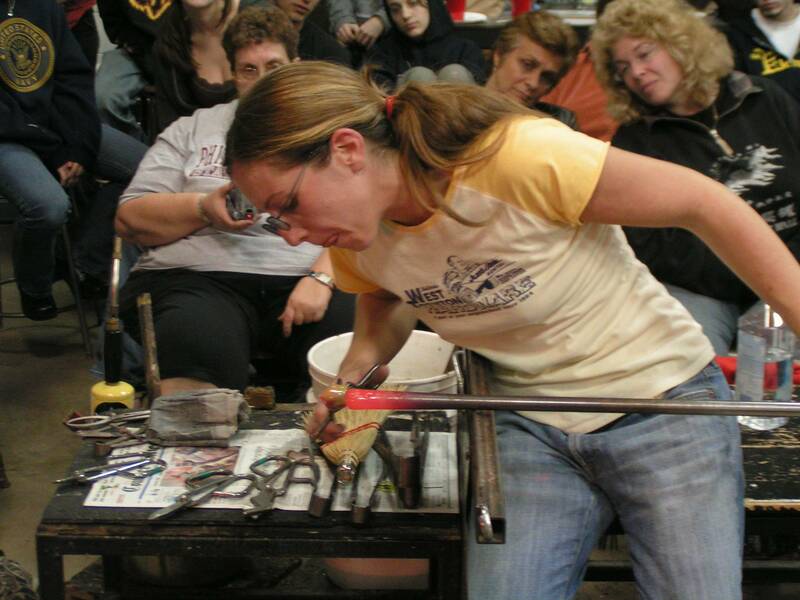 The photo at the left was taken at the Glass Art Society (GAS) 2007 Conference - of the Hot Glass Color & Supply booth. Rod Cutter The rod cutter shown to the left was in the same Hot Glass Color & Supply booth as the above rods. The rod cutter is much like your typical paper cutter, but much stronger. As a section is broken off, you can see small pieces of frit fall to the table. Safety Glasses I now believe that the very first purchase for the aspiring glass artist is a good pair of safety glasses, and I especially like Mike Aurelius's AUR-99's which you can see at www.auralens.net. Glassblowers in particular should consider the AUR-99. If you require prescription lenses, consider buying your next pair with magnetic clip-on sunglasses. 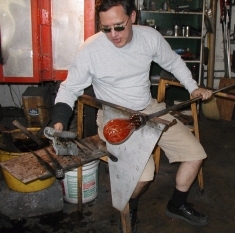 Mike Aurelius can replace the regular sunglass lenses with his AUR-99 and you are ready for glassblowing! This lens is a soft green in color and is available in shades 1.7, 2.0, and 2.5. 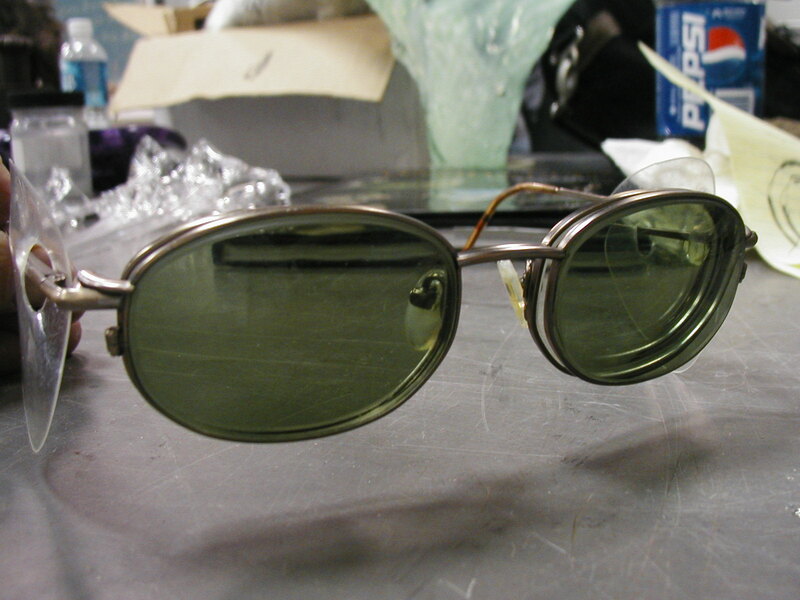 The spectral response of this glass shows excellent ultraviolet and infrared protection. The visible light transmission is adequate for good visibility under most shop working conditions where illumination is somewhat limited. These filters DO NOT provide sodium flare protection. Suggested uses are offhand work, allowing for comfortable viewing of glory holes, fire buckets, gathering, enameling, and general kiln work. AUR-99 bifocals are supplied with Aura's exclusive .Uniform Density. feature. A 3.2 mm thick wafer of AUR-99 is laminated over a thinly ground glass bifocal lens, giving you the same filtration through the bifocal as around it. No other manufacturer can make this claim. 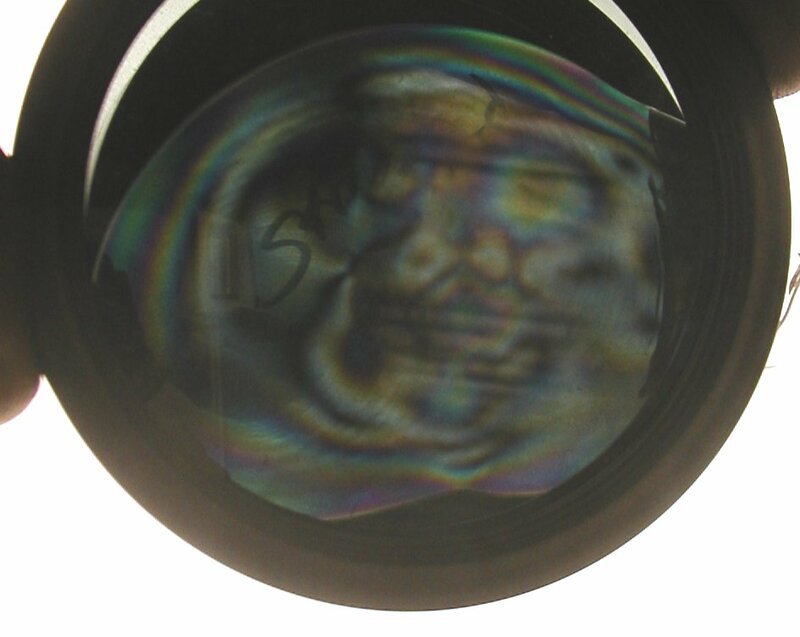 This lamination process also makes for a safer lens. Lenses are available in plano (non-prescription), single vision, and laminated bifocals. THIS FILTER IS NOT DESIGNED FOR USE BY LAMPWORKERS. One of the best aspects of the AUR-99's is the moderate price. Depending on frame style, a pair of AUR-99's cost US$45 - US$110 as you can see in this price list. Soffietta Also known as the "Aluminum Puffer" on Steinert's website. If the gaffer does not already have at the bench, usually will just yell out, "I need the Soffi!" or "I need the Puffer!". 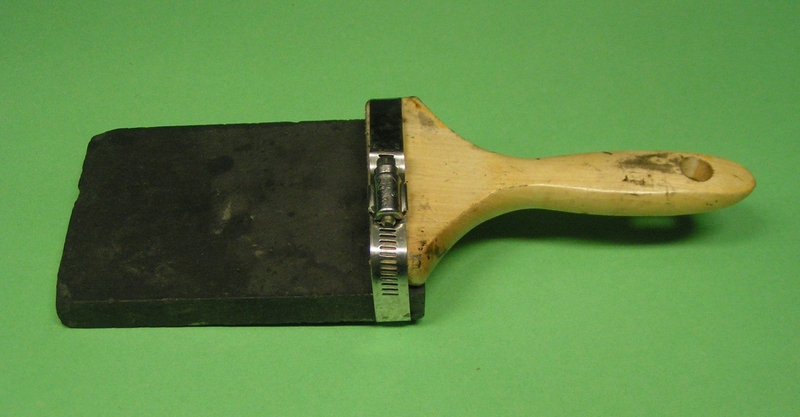 Typically used by the gaffer to add air to a piece, after transfering to the punty, i.e. to "open up" the bowl of the piece being worked on. Wonder how a soffietta is made? Take a look at this fascinating web page! Some studios are setup with the conical head of a puffer connected to an air hose so the gaffer does not actually need to blow to inflate the piece. Striking Colors Some colors of rod, frit, or powder are affected by heat, and when heated to 1000 degrees F or more, the colors strike (change) to their new color. In other words, "don't judge your color by what it initially looks like" (because, indeed the rod may be clear), but the true color comes out only after heating (and the more heat which is applied, the darker the color will become). 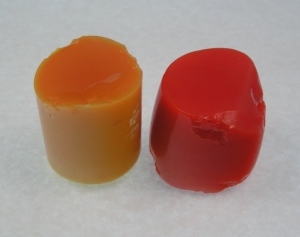 The two pieces of glass on the left are from the same rod of Reichenbach R-147 "Fire Red", but the one on the right was heated in a kiln to about 1375F, to achieve its final color. And it is not only the case that striking colors get only little darker when heated, take a look at these Gabbert Cullet Ruby Buttons which change from water-clear to super-dark-ruby-red when heated! 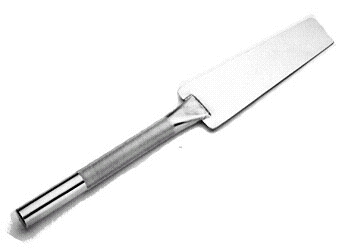 Tagliol A tagliol (usually just called a "tag") is a metal paddle used primarily to flatten the bottom of a piece of glass, so that it will sit flat on a table. The alternatives to a "tag" are a graphite paddle , a wood paddle , or wet newspaper (although wet newspaper is not likely to get the bottom of the piece as flat as the use of a paddle). 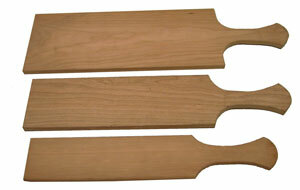 Unlike a wood paddle, you do NOT want to get water on your tag. The Tagliol shown at the left can be purchased from Cutting Edge Products for US$50 - US$70 (depending on size). Thermal Conductivity When you are working on your glass, sometimes you need to cool it down rapidly ("crackle piece") but most of the time you want to maximize the "working time" and keep the glass as hot as possible, and minimize the amount of heat removed from the piece (and before a reheat in the gloryhole is required). This is where the concept of "thermal condudivity" (or conversely "thermal insulation") becomes important. Similar to the concept when designing a furnace, annealer, or gloryhole (to retain the heat). The bar graph shown to the left is from here and illustrates that the principles of thermal conductivity have many applications, from building insulation through cookware through glassblowing! Threading Wheel While it is quite possible to thread a spiral onto your piece at the bench, it is easier if you use a Threading Wheel (also known as a Threading Machine). Click here for a close-up of the working ends of the Threading Wheel, or here for a really detailed close-up. Note the bolt which allows changing the angle at which the ends are positioned. The ends needs to be at the same angle, but the more angled they are, the faster the blowpipe rotates, and the wider apart (or closer) the spiral is spaced. Steinert Industries website shows their Threading Machine. 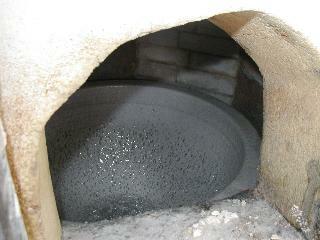 A small amount of glass is gathered onto the end of the punty from the furnace, and shaped as desired. 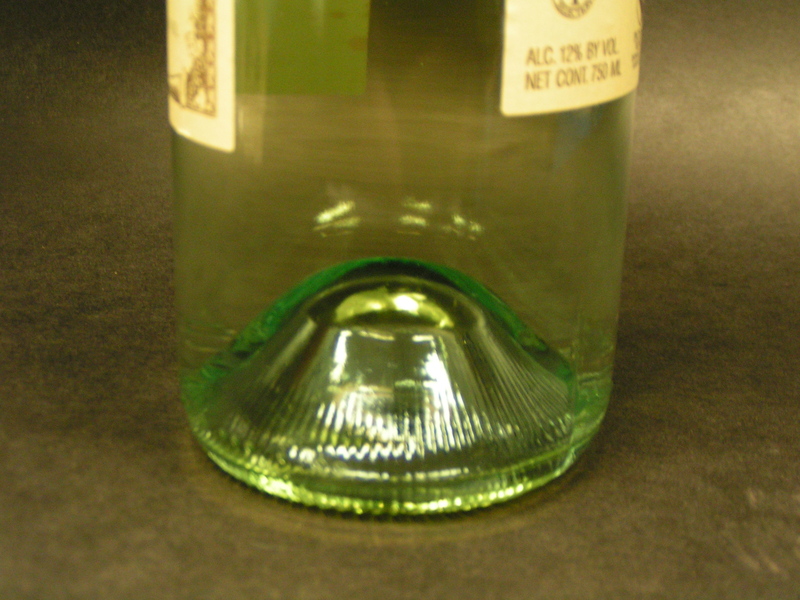 The punty should be neither too cold nor too hot when it is attached to the bottom of the glass piece. The gaffer usually uses the end of the diamond shears (or any other similarly handy tool such as tweezers) to place the punty in the center bottom of the glass piece. Normally a drop (or more) of water is placed on the jack line to cause a chilling and micro-fracture in the surface tension of the glass. 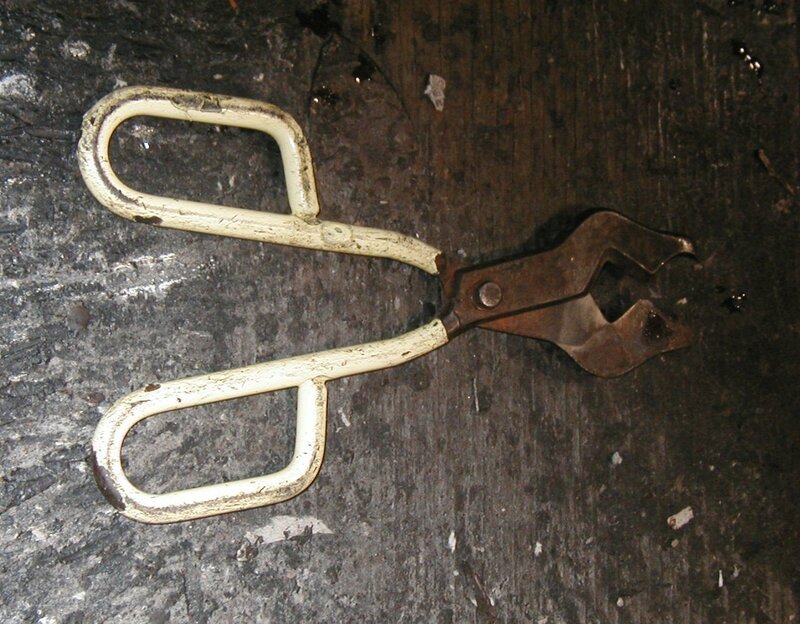 Some gaffers prefer to dip a metal file in water and run the file over the entire jack line. The moile is then normally moved to the bench arm, and the blowpipe is tapped with a metal tool such as the back of the jacks (not the springy part of the jacks, but the two parallel handle parts at the same time togther). If lucky/skilled, only one tap will be needed. Do not tap too hard, as this can cause the piece to crack. If after several taps, the piece is not free of the blowpipe, apply more water. Once transferred, the lip (top) of the piece can easily be worked on. (Beeswax) Wax is used to lubricate the jacks. 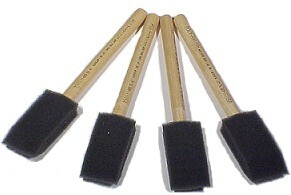 You'll know when your jacks need wax -- they will start to squeak when you use them on a piece! There is usually a small extension tray (wax post) on the glassblowing bench which holds the wax, and as shown in this glassblowing bench construction diagram (on the Correll Glass Studio website). If your jacks are too cold to melt the wax on the tray, just "hit" them with a little heat from the MAPP Gas Cylinder -- that will heat the jacks up in a couple seconds to the point where the wax will easily melt onto them. Different glassblowers prefer different types of wax -- Bee's Wax and Carnauba Wax are two off-the-shelf, but hard-core glassblowers will mix up their own special wax. Rick sells his bees wax for $4.00 per pound, and shipping for up to two pounds via USPS is only $3.85. 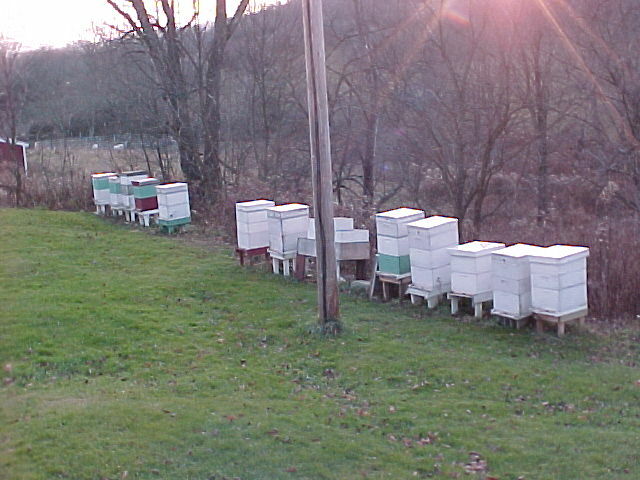 Rick tells me that "The Bees Wax I sell online is from cappings before the combs are extracted so it is the newest and cleanest in the bee hives". Wet Newspaper Can something as simple as 5, 6, or 10 sheets of wet newspaper be a glassblowing tool? Yes, indeed! Many glassblowers feel that the New York Times and Wall Street Journal are printed on a better grade of paper, and consequently work better. It is recommended that you avoid, if possible, pages printed in color (as opposed to black), as whatever is on the page is going to burn as the newspaper is held to the hot glass, and the fewer chemicals in the smoke, the better! Page 12 of Ed Schmid's Advanced Glassblowing book (highly recommended!) has instructions on how to fold the paper into thirds, and then thirds in the other direction, and then cut the corners off so that the water can more easily drain out. The more compulsive glassblowers will make these up in advance at home, so they do not waste any precious bench time folding the newspapers in the studio! "Alfredo Barbini pioneered the technique of sculpting in vetro massiccio and was the first person to use wet, folded newspaper as a tool; he was Pino Signoretto's maestro." Witches Balls are similar to glass ornamants that hang on Christmas trees, BUT they have internal glass strings, spanning the inside diameter of the spheres. The "secret" (Shhh! Don't tell anyone!) to making the "internal strings" inside the Witches Balls are "outside calipers", an example of which is shown above right. These are easy to purchase inexpensively on eBay. Outside Calipers are available in many different sizes, so be sure you get one large enough to "span" the glass art you are going to make. Wood Blocks Wood blocks are kept wet in the bucket at the bench. Wood blocks are used to both shape and cool the hot glass. Serve as a quick and adjustable heat-sheild to keep the gaffer's arm and hand from burning up! This is most often done holding the paddles "backwards" such that the handle of the paddle is protecting the gaffer's fingers. The paddles shown in the photo are from Northwest Iron Works. 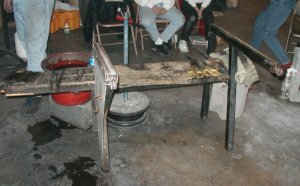 The top two side-by-side photos are examples of floor-standing yokes (standing yokes) which are used in glassblowing in front of the furnace and gloryhole, to rest the blowpipe or punty on. These are typically constructed with ball bearings in the top, which permit the blowpipe or punty to rotate, especially usefule for the gloryhole. You can roll the piece both forward and backward on a standing yoke, as well as circular rotation. For large or heavy pieces, a rolling yoke is much preferred -- this allows the piece to move forward and backward. There is a track on the floor which the rolling yoke rolls on (hence its name). The rolling yoke also has ball bearings at the top, but the main aspect to keep in mind is that the rolling yoke can move into (or out from) the gloryhole at the same time the piece is being rotated. The real difference between the two types of yokes is that the standing yoke has a fixed pivot point, as you move the piece into the gloryhole, the weight (center of gravity) moves substantially forward. With the rolling yoke, you can move the piece into the gloryhole while maintaining a consist pivot point, without having the weight shift of the piece. Notice in the bottom photo, the position of the left foot to move the rolling yoke in or out along the track. The advice offered on this web page, and this website, is for general educational information only. Glassblowing is inherently a dangerous activity, and serious injury can occur for any number of reasons. from the application or misapplication of any information found on this website.